For small businesses cropping up and cashing in on bicycle tourism, it’s not always easy. Even when conditions seem ripe for a new venture, financing for small businesses can be tough to come by. And the authentic experiences in unique locations that sell a destination often don’t scale up for easy expansion. But that doesn’t mean there aren’t good livings to be made. In one part of the country, there’s help. In America’s rust belt, small business consulting services have taken note of the opportunities that trails offer, and begun to support trail-based businesses create conditions for success. ?Once the [Great Allegheny Passage] (GAP) was connected and the Trail Town program emerged, that’s when people started to take notice, — says Elissa Garofalo, President and Executive Director of the Delaware & Lehigh (D&L) National Heritage Corridor. A recent economic impact study showed $238 million in spending, 3,323 related jobs generated, and tax revenue returned to communities along the D&L corridor of more than $22 million. Since 2010, the Greater Lehigh Valley Chamber and Carbon Chamber & Economic Development, along with the region’s federally-funded Small Business Development Centers, has offered consulting services to trailside businesses, as well as small business start-up and expansion loans. Most assistance is free, and ranges from location assistance to business planning to help with financial projects, licensing, or marketing. Half of the 158,000 annual visitors to the Erie-to-Pittsburgh Trail come by bike, helping pump $6.9 million into small towns in the oil region of northwestern Pennsylvania. ?The economic impact of the trails has only grown over the past three years, and more and more people are accessing the trails in our region,? says Deb Lutz, former Vice President of Economic Development of the Oil Region Alliance (ORA). Since 2012, ORA has run an annual Get on the Trails! Business Plan Contest to promote business development along the fast-developing trail by awarding cash to new and expanding small businesses for the best plans designed to expand services to trail visitors. When promoting its expertise, the regional chapter of SCORE, a nonprofit that connects new business owners to experienced mentors, encourages aspiring small-scale entrepreneurs to consider the benefits of trail-based business. Much of the increased recognition of the importance of positioning small trail-based businesses for success can be traced to the Progress Fund based in Greensburg, Pennsylvania. As a non-profit community development financial institution (CDFI, basically a non-profit bank), the Fund has supported new and expanding tourism-based businesses since 1997. 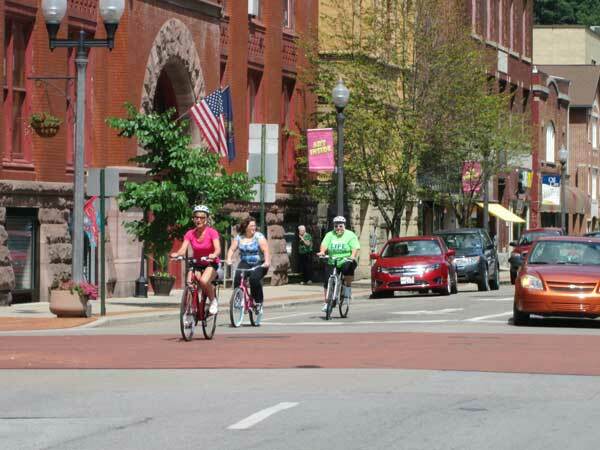 In 2007, the Fund launched the Trail Towns program, the first program to formally promote trail-driven economic opportunity for small rural towns. Every loan the Fund makes comes with business coaching to best position a small business for success. Some need little coaching, while others need help with fundamentals like assessing who their market is, says Co-Founder, President, and CEO David Kahley. For instance, a new business operator looking to attract bicycle tourists might not know that these visitors ?would rather spend $10 for a better product than $5 for a schlocky product.? While Kahley describes the capital that the Progress Fund lends as the “secret sauce” of trail-based business development, he also emphasizes the value of consulting knowledge. “We are not in the loan business, we are in the entrepreneurial support business.? > How big is the outdoor recreation economy?